Abrasive grinding wheels - descriptions, photos and technical specifications, global manufacturers. Send inquiries to the manufacturers and contact them directly. 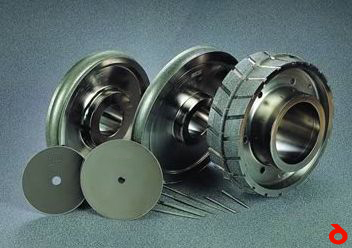 Grinding wheel for surface and external grinders. Superabrasive diamond and (CBN) (cubic boron nitride) tool for higher quality, durable and effective grinding, and machining. Hot pressed CBN grinding wheel, primarily, for steel industry. This grinding wheel is used at high speeds - around 80 M/S, and with a pressure, applied to the wheel, can exceed a ton. Centerless grinding wheel for grinding or plunge in a row, especially for mass production. This wheel can be bonded with vitrified or resinoid. Double-disk grinding wheel is mainly used for mass production in order to repeat the same thickness of machined parts. These wheels are usually bonded with resin bond, but can also be achieved with vitrified bond.